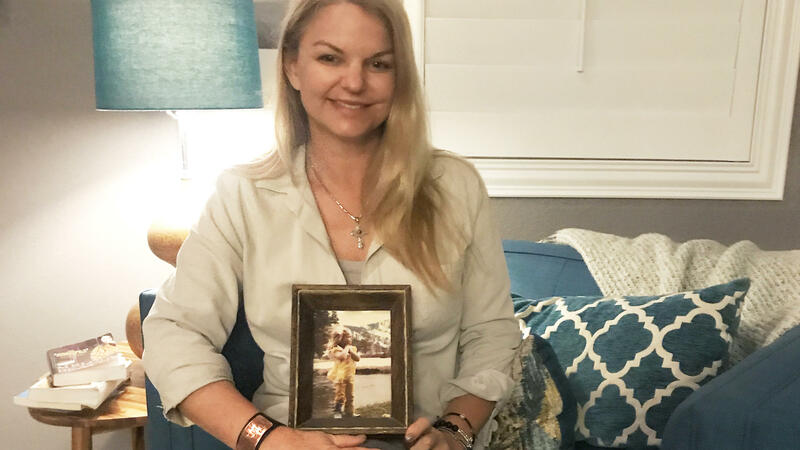 Christine Caria in her home, holding a picture of her as a child in Lake Tahoe. It's her "happy place" that she thinks of when traumatic thoughts get into her head. It's a picture of a man smiling, later that night he was killed in the single deadliest mass shooting in modern American history. That shooting happened more than three months ago in Las Vegas but it's a night that Caria relives everyday. She sees it in flashbacks before she sleeps, in her nightmares, speaks about it in her therapy sessions. She saw people get shot, she was trampled by a crowd, separated from her friend Sallan who also witnessed unforgettable carnage and ran for her life, unsure if it was one shooter or a gang of shooters searching for prey. "That's what people don't understand, we thought there were guns everywhere," she said. By the end of the night 58 people would be dead and more than 800 wounded. It's changed the two women's lives forever. But the Las Vegas Victims Fund set up to collect donations for victims of that shooting spree will not go to her or thousands of others suffering emotional trauma. The fund is falling short of others set up in response to devastating tragedies. After the Boston Marathon bombing, some $80 million was ultimately distributed to the more than 200 victims and the families of the three people killed. In Orlando the OneOrlando Fund raised upwards of $29 million after a shooter killed 49 people and wounded 58 others at the Pulse Nightclub. Anyone who witnessed the shooting was eligible for $25,000 from the fund to help with trauma. But in Las Vegas so many more lives were affected and the fund has raised just upward of $22 million. That sounds like a lot until you divide it by 24,000 — that's the estimated number of people at that festival when the shooting happened, between approximately 22,000 festival-goers and the people working the festival. "The number of people who can claim an emotional trauma from this is a giant number," said Scott Nielson, the chairman of the Las Vegas Victims Fund. "And with 22 or more million dollars, when you try to distribute it to that many people it becomes a very small sum for the people severely impacted so that's the difficult part of what the committee has had to do." So right now there are three tiers of people who will get money from the fund. The priority are the families of the dead and the catastrophically injured — people with brain injuries or paralysis. Then people who were hospitalized due to their injuries and finally people who had to be treated within days of the incident for their wounds but were not hospitalized. In part, the fund may be suffering because of the back-to-back tragedies in 2017 and into 2018. "I think we're a little bit unfortunate because there were hurricanes before this event and then right after that there were the fires in northern California," Nielson said. "People's attention was diverted from one to the next to the next and those are big catastrophes." Think about it, before the shooting there was Hurricane Harvey that flooded Houston, then Irma in Florida then Maria that devastated Puerto Rico. Right after the shooting in Las Vegas there were the fires in northern California that killed dozens, then a mass shooting in a Texas church, then more fires in southern California and fatal mudslides. They hope to raise more, they are taking applications from victims through the end of January and are asking donors to try to give by then as well so they know how much they have to distribute. But the fund won't close and if they raise more, they'll do a second distribution like Boston did, Nielson said. He said the process of deciding on how to distribute the money has been difficult and they're referring victims with emotional trauma to local services that can provide counseling and other help. Back at Caria's house, she sits in her backyard 20 minutes from the strip after a day of doctors' appointments. "It's been really hard on the whole family," she said. "I have really, really terrible night terrors where I wake up the whole entire family." She sees a physical therapist weekly, on this day she got a cortisone shot in her back to help with the pain. She was injured from people stepping on her. And last week she had a seizure because of the medication she was taking for her pain. Her memory is suffering. "It feels like Alzheimer's, is what it feels like," she said. Although she's physically injured, she didn't seek medical care until later because she didn't have insurance at the time as a new transplant to Las Vegas. Now she can't work and doctors told her she can't drive for three months because of the seizure. "There was just too many people that got hurt and the people of Las Vegas have been great but my goal here and what I want to do right now is try to find out what we can do on the national level to help the people." she said. "Eighty-seven people lost their parents, $22 million is not enough money to take care of them when you take out the earning potential of the rest of their lives. There's just not enough money in that fund and we need to figure out a solution." Since the incident she and her friend Sallan have started support groups in Las Vegas and Reno respectively. They've also started chapters of the Brady Campaign to Prevent Gun Violence in both cities and recently went to Washington, D.C., to talk about gun violence and the need for national support for the victims. Emotional trauma can really disrupt lives. Sallan, for example, was a take-charge business woman with a boot accessories company before the shooting. Now she says she's overwhelmed by small tasks and she's thinking about shutting down her company. "I can't go around the country and comfortably do festivals and shows and all the things that I've been doing the last four years," she said. Setting up the booth for her product, Boot Roxx, is a trigger. Country music is also a trigger. "I believe that anywhere I go something horrendously catastrophic like that can happen," she said.